Buff'd Cosmetics Has a Great New Look! It has been a long time in the works but it is finally here! Buff'd Cosmetics' new website is now up. While we were looking for a fresh and modern look to go with our newly designed logo, we wanted the site to remain user friendly and easy to navigate. All products are now easy to find under seven categories - Face, Cheeks, Eyes, Lips, Body, Kits and Tools. We have updated the product and category photos so that they more accurately reflect the actual products and colors. Sample sizes of all our powdered minerals are now available for order through the website and they come with free shipping to all destinations. Most products have had their prices lowered on the full-size jars - our Mineral Foundations are now only $15.00 for the 21 gram jar. We have added several new features including a "view all shades" window which allows clients to view all the shades of a particular product in one convenient window. This will be particularly useful when selecting a foundation shade as now you will be able to compare all the shades in one place. Our shopping cart also received an update. Now when you add items to your cart they will remain in your cart until you checkout or remove them. Once an order has been placed you will now be notified when your order has been shipped. Also, you can now log into your account and view past orders and their status. So if you have not visited us lately please stop by and let us know what you think. 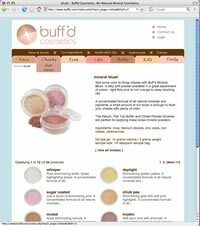 In conjunction with the new website, Buff'd Cosmetics launched two new product lines. Color Correctors are feather-light powders formulated specifically for skin that needs a little extra help. Available in five distinct shades, a light dusting of our Color Correctors will help conceal discoloration from acne, scarring, rosacea and age spots leaving a spectacularly flawless complexion. Eyebrow Mattes are a collection of silky matte shades for defining and filling eyebrows. Also great as	eye shadows and eye liners, Eyebrow Mattes can be applied dry for soft highlights or wet for rich color. We have also added several kits to our product line. The Super Starter Kit comes with everything needed to get a great mineral makeup start at huge savings - and free shipping! The Foundation Refill Kit and Blush Refill Kit are an inexpensive option for refilling your favorite Buff'd Cosmetic foundation or blush jar. New Foundation and Eye Shadow Shades! In response to client requests we have formulated a new foundation shade. Camel is a medium-dark shade with heavy yellow undertones and now becomes our darkest yellow-toned shade. We are currently formulating an additional yellow shade that is even darker than Camel. Very soon all our foundation shades will be available in three formulations - Light, Original and Concealing. Light will be a sheerer formula for those who only require the lightest coverage. Concealing will be what our concealers were - formulated with a touch of Kaolin Clay providing heavier coverage and fantastic oil absorption. Original is going to be what we carry now - a great all-purpose foundation with build-able coverage. Numerous new eye shadow shades have been added to our collection. Cozy, Shy, Humble and Chestnut expanded our neutral/brown selection. Gracious, Sultry, Delight, Drama,	Plum Pudding and Masquerade were added to our pink and purple shades. Prism,	Shady,	Grand and Madness also made great additions. We are always looking for new shades to formulate. If you have a particular color that you are looking for please let us know. Our next new shade just might be yours! Buff'd Mineral Cosmetics are made with the finest minerals and pigments, oils and waxes, and natural preservatives and fragrances - all free of irritants and toxins.